We're not sure how they do it so quickly, but many children manage to accumulate mountains of toys that are pulled out, played with and discarded every day! We're all familiar with the sight of a previously pristine living room floors covered in toys which have enjoyed attention for a short while then have been abandoned until next time...Which is why we have chosen this lovely range of toy storage to help grownups and (if we're lucky) children tidy up and keep toys organised. 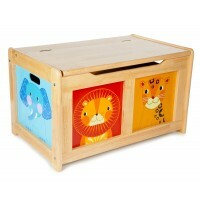 We're sure you'll find just what you need in this fine selection of toy storage ideas.